Cathy Birchall is the first blind person ever to circumnavigate the globe on a motorcycle. Description Cathy Birchall is the first blind person ever to circumnavigate the globe on a motorcycle, covering 26,385 miles, 31 countries and 5 continents with her companion Bernard on an 18 year old motorcycle. From feeling the traffic passing so close it touches you as you ride through Indian cities, to mounting an elephant from the front (yes, really!) in Nepal and climbing the mountain at Macchu Picchu in Peru with its innumerable steps and vertiginous drops, Touching the World takes you on a journey of extraordinary beauty and interest, full of surprises. It is unique in the perspective it takes, because Touching the World is written from Cathy’s point of view, that of a blind woman. “Men do not want you if you are blind, why would you want to be with a blind woman?” asks Neena at the Centre for Blind Women in Delhi as Cathy and Bernard experience some heart wrenching cultural differences where a blind woman was considered doubly afflicted and worthless. Their old BMW motorcycle keeps breaking down and you feel for Bernard as the lights dim in Malaysia and the bike grinds to a halt with a dead battery! But somehow they keep the bike going and in this they were often helped by the unwavering kindness of strangers. From border guards guiding Cathy’s hand to the bike to anchor her in a strange place, to Glen helping perform open heart surgery on the bike in the Nullarbor desert, the natural generosity of people is vividly portrayed. Touching The World challenges our perceptions of our own boundaries as well as those of others and portrays vividly just what it means to be blind in a way that has never before been attempted. It gives you a real insight into the nature of blindness and the ability of the human spirit to transcend almost any difficulty. If this question can be answered then Cathy Birchall’s story comes as close as is possible! Try before you buy! there is a free sample chapter from Touching the World availabel as an ebook through most ebook sellers including Amazon. You dont need any special equipment - free reading software for Amazon and most other formats is readily available. 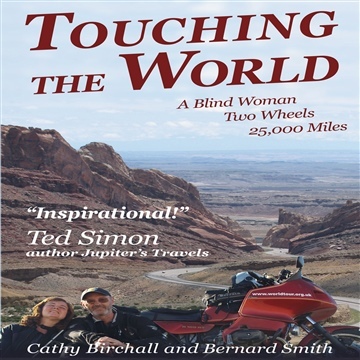 Cathy Birchall is the first blind person ever to circumnavigate the globe on a motorcycle, covering 26,385 miles, 31 countries and 5 continents with her companion Bernard on an 18 year old motorcycle. AUDIO BOOK and E-BOOK Now Available! “Cathy’s courage has been truly inspirational for many blind and partially sighted people across the world.” Stephen Remington, CEO, Action for Blind People.